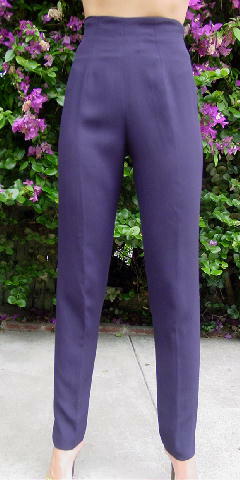 These eggplant colored pants are Christian Dior Boutique Paris. They have a 9" left side zipper, interior eyehook, and a nice dark blue with a touch of gray synthetic full lining. There's no fabric tag, but they feel like a silk blend. 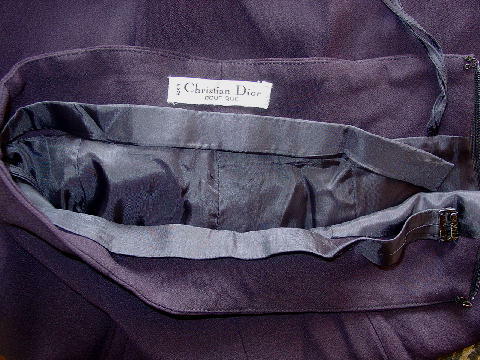 The interior lining as it meets the base of the interior fabric has a separate 3/4" wide, lining-covered separate panel which goes around the interior and hook on the left side. The bottom outer side seam pant legs have 2 1/8" long slits. waist to hem 44 1/2"